The Princess of Montpensier is set in 16th century France, a time when ill patients were bled, traveling salesmen sold elixirs and salves, and impromptu jousts were commonplace. The film’s titular princess, Marie, has an uncontrollable knack for attracting men, this film may indeed feature cinema’s first “love pentangle” though not all of the suitors are in their beloved’s favor. Marie is in love with her noble cousin Henri de Guise, but is forced into a loveless marriage with an overly protective prince. The prince spends a great deal of time away from home, leaving Marie in the care of a pacifist count who quickly confesses his love to her. The villainous Duke of Anjou joins in on the fun and a series of gatherings between the lot of them lead to betrayals, broken hearts, and untimely deaths. With an unnecessary running time of 139 minutes (especially considering that it’s based on a short story), the film ultimately feels like a cable television miniseries with slightly higher production values than usual. Accomplished French director Bertrand Tavernier provides the film with a general murkiness, but it’s the story that’s of utmost importance in this case. Tavernier guides his many characters towards their fates with a degree of skill necessary to keep the plot straight and avoid boredom in its viewers. Fans of period soap operas need apply. 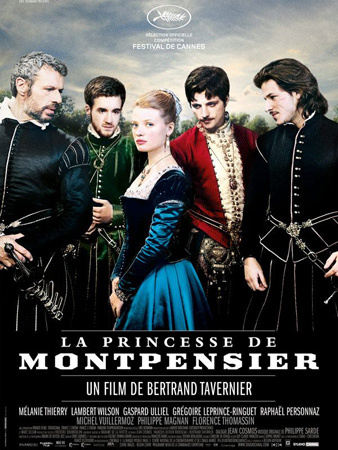 The Princess of Montpensier opens today at the Ritz Five.